This hike along the shore of the Westereems will take 1 to 3 hours, according to your personal liking. We will wade through a few creeks and pass beautiful shell banks. 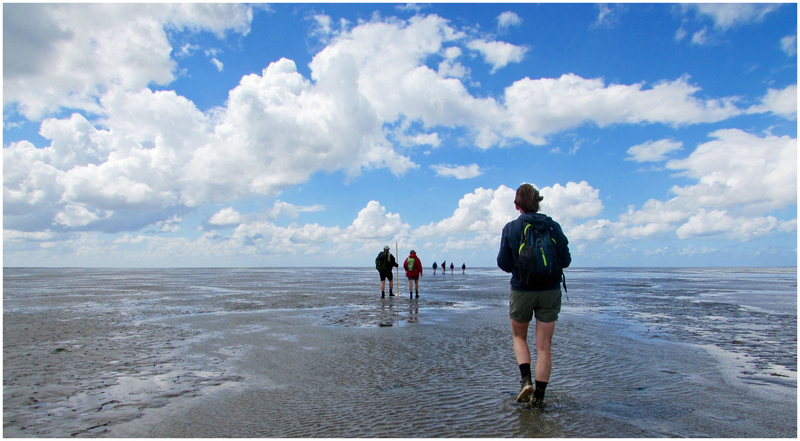 The tidal flats are easy to walk because it mainly concerns hard sand. This easy trip is very suitable for children from about 10 years. • Departure point “Noordkaap”, Middenweg, Uithuizen. Tour with the Wadden Vereniging: Departure point, parking at Restaurant Diekgat, kelderweg 6 eemshave. restaurant Diekgat, kelderweg 6 9979 XN Eemshaven. Tours by appointment for at least 6 participants: date and time after consultation at aanvraag@vrijewadlopers.nl .